Each time you send a campaign to a list, Mailchimp stores performance statistics in the Lists section of your account. The Overview page for your list contains a general summary of list health, activity, and performance, so you can view trends and engagement over time. In this article, you'll learn about your List Overview statistics. To find your list stats, follow these steps. Click the name of the list you want to work with. Click the Stats drop-down menu and choose Overview. You can also access Social Profiles from the Stats menu if you have that integration enabled. The Overview page displays the following information. 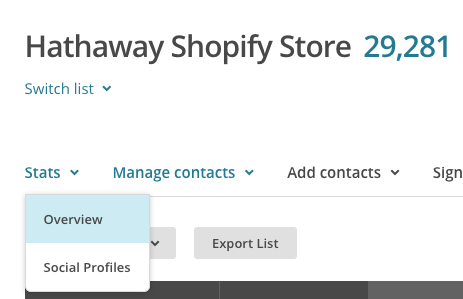 At the top of the page is a breakdown of the different types of contacts in your list. Subscribed Contacts opted in to receive your email campaigns. Non-subscribed Contacts interacted with your online store, but haven't opted in to receive your email marketing campaigns. Unsubscribed Contacts previously opted in to receive your email marketing campaigns, but aren't currently. Cleaned Contacts are bounced addresses that are considered non-deliverable. The list performance section offers an overview of the list's subscriber activity. Average Open Rate shows an average of all the open rates from every campaign you have sent to the list. Average Click Rate shows an average of the click rates from every campaign you have sent to the list. Average Subscribe Rate displays the number of people who have joined your list each month on average. 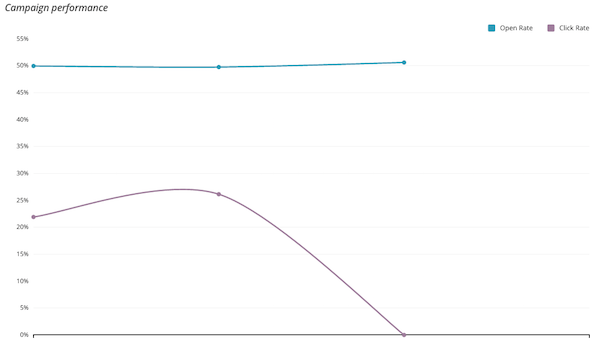 Average Unsubscribe Rate displays the number of people who have unsubscribed from the list each month on average. This chart shows you trends in subscriber growth. Above the chart, choose a timeframe from the drop-down menu to compare your audience growth over a period of 7 days, 30 days, or 1 year. Audience Change shows the increase or decrease of your list's total subscriber count, compared to the previous timeframe. Existing subscribers shows subscribers who were already saved in your list. This section shows the number of subscribed, unsubscribed, and cleaned addresses since your last campaign. Click the linked number for any of these stats to see which email addresses fall into each category. 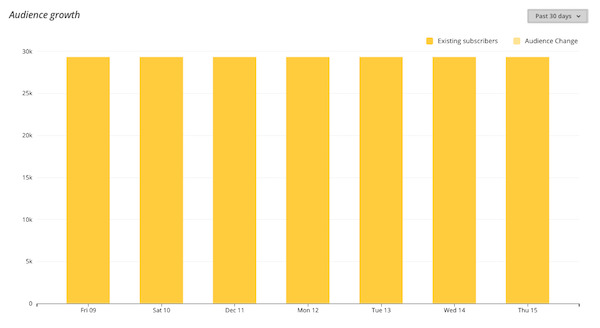 The campaign performance graph shows the open and click percentages for the last 30 campaigns that have been sent. We only include campaigns with 20 or more subscribers to prevent test campaigns from skewing performance results. Click any graph point to open a detailed report for that specific campaign. As your subscribers open and click campaigns, we'll track which email client they use. Since we can only collect this information for subscribers who interact with your campaigns, the chart shows data for your most active subscribers and ranks the clients by popularity. It's helpful to know which email programs your subscribers use, because it can help you tailor content and layout. For example, if the majority of your subscribers use Outlook or mobile devices, you'll want to spend extra time tweaking your campaign design and to display nicely in those inboxes. When you use our Inbox Preview feature, you can click the Top client usage from your list link to view which email clients your subscribers prefer. Choose these email clients to preview how your campaign will display in the different email clients. Top locations shows you where your subscribers open your campaigns. Click any country name to create a segment based on the locations detected for your subscribers. Locations are determined by geolocation tracking. Mailchimp tracks data from wireless router access points and other service providers to estimate where an IP address is located. Subscribers who do not use static IP addresses can be harder to pinpoint, but we'll attempt to tie multiple locations to a single point, and will provide this location in your statistics. More information about geolocation tracking is available in this thorough 2004 article from Linux Journal.